How do I know that an item is available to be ordered online & shipped to store? Just look for the following icon on items while browsing at tscstores.com. When you see the icon, the item is available to be ordered online and shipped to store. Are all items available to be ordered online & shipped to store? Not all items that we carry are available to be ordered online & shipped to store. Only select items are available at this time. What is a Factory Ordered product? When an item is shown as a Factory Ordered product, it ships from the manufacturer to our Distribution Centre before arriving at your chosen TSC Store. Orders arrive within 2-3 weeks. Can I call my local TSC Store or pick up location for any online order questions I may have? Our Ecommerce Customer Service Representative would be happy to help with any questions you may have. Please contact us at ecomm@tscstores.com or 1-844-726-9511 Monday to Friday 8am - 4:30pm. It's simple. Click the 'add to cart' button on items that are available to be ordered online & shipped to store. When you are done shopping, click on ‘Checkout' in the top right of your screen. Then follow along with the Checkout instructions to order your item(s). This includes selecting your store for online order pick up & paying for the item in full. No. Users have the option of creating an account or using a guest account to place an order. Having an account will allow you to track your order. Will you confirm that you received my online order? Yes. An Order Confirmation email will be sent to you immediately once your order has been placed. If you do not receive one, contact us at ecomm@tscstores.com or 1-844-726-9511 Monday to Friday 8:30am - 4:30pm. At time of pick up, please bring the credit card used to make your purchase, a government issued ID, and your Pick Up email to verify the price. For your protection, orders can only be released to the customer who placed the order. Unfortunately, we cannot allow anyone to pick-up an order on your behalf. Customers can track the progress of their online orders in My Account. Email notifications will also be sent when a customer places an order, when the order has shipped from the Distribution Centre, and when the order arrives in store and is available for pick up. Can I choose which store my order gets shipped to? Absolutely. 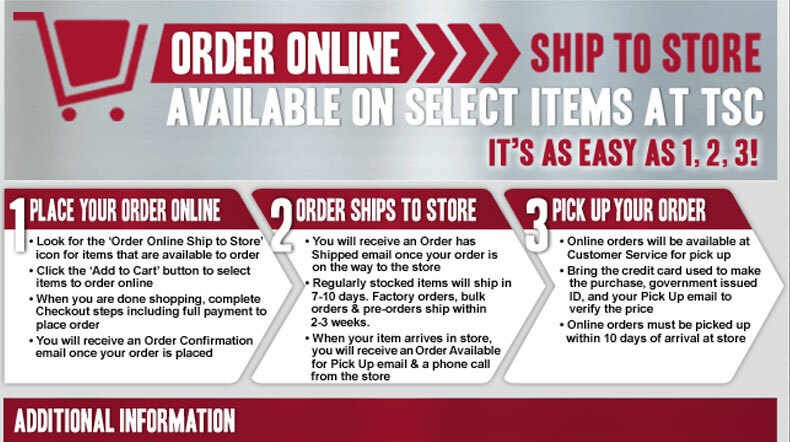 During the checkout process, you will be asked where you would like to pick up your online order. Online orders can be sent to any of our locations. What is required when I come to pick up my online order? At time of pick up, please bring the credit card used to make your purchase, a government issued ID, and your Pick Up email to verify the price. For your protection, orders can only be released to the customer who placed the order. Unfortunately, we cannot allow anyone to pick-up an order on your behalf. Order pick ups must be completed within 10 days. Regularly stocked items should ship to store within 7-10 days. Factory orders, bulk orders, and pre-orders should ship within 2-3 weeks. You will receive an Order is Available for Pick Up email plus a phone call from your TSC pick up location to confirm your order is ready for pick up. Order pick up must be completed within 10 days of the order arriving in store. TSC will use their best efforts to ship online orders as per the timing specified for the product. In some instances, exceptions may occur due to circumstances beyond TSC’s control. TSC will attempt to notify the customer when orders may be delayed. If a product becomes unavailable, the customer will be contacted to discuss the circumstances. Ship dates vary by item and store for pre-order items. When a pre-order is placed, a TSC Ecomm Team Member will contact you with an approximate ship time. You will receive an Order is Available for Pick Up email plus a phone call from your TSC pick up location when your order is ready for pick up. Order pick up must be completed within 10 days of the order arriving in store. Please note: when purchasing a trailer online it will need to be assembled at the store after it arrives. We recommend you phone the store to make arrangements for assembly to ensure the trailer is ready at the time of pick up. Where do I pick up my online order in store? Your online order will be ready at the Customer Service Desk for pick up. Why does it take 7-10 days for my item to arrive in store for pick up? Your order will ship from a central Distribution Centre, and may require up to 10 days to travel to your pick up location. Why does it take 2-3 weeks for Factory Ordered items to arrive in store for pick up? Factory orders ship from the manufacturer to our Distribution Centre before arriving at your chosen TSC Stores, and may require 2-3 weeks to travel between destinations. Do I pay for the item online? Yes. All orders must be paid in full when placed online. Online orders can be paid for by Mastercard, VISA and American Express. When will I see the charge appear on my credit card? Once the order is placed, you will be charged a 100% deposit for your order. Can I split payment for my online order over multiple cards? Can I use a TSC Gift Card or eGift Card to pay for my item? Gift cards cannot currently be used online. Your order will not be processed and you will need to supply another credit card to successfully place your order. TSC Stores reserves the right to charge up to a 10% restocking fee for an Online Order Ship to Store product(s) that are unclaimed after 20 days of the order date. This restocking fee will be applied to the credit card used for order validation during the checkout process. If I order an item online at regular price, and it is on sale when I pick up it up, do I receive the sale price? Yes. Customers will receive the sale price if the item is on sale at time of pick up. You will always receive the better price for your online order. Your order will be refunded at the store, and then you can re-purchase for the lower price. If I order an item online at a sale price, and it returns to regular price when I pick it up, do I receive the sale price? Yes. Customers should bring their Order Available For Pick Up email with them at time of pick up to ensure they receive the price on the item as per time of ordering. You will always receive the better price for your online order. I have an Online Promo Discount Code. What do I do with it? During the checkout process, you will be asked to enter any Online Promo Discount Codes that you have. Note that Online Promo Discount Codes are only valid for certain time periods and then they expire. Although we strive for accuracy, some errors may occur. TSC reserves the right to correct any errors regarding pricing or products. What if my online order is not what I expected when I go to pick it up? If the item does not meet your expectations, you are not obligated to take the item home. We will refund your purchase at 100% of the purchase price. I need to return an item I purchased through Online Order Ship to Store. How does that work? Our regular Return Policy applies to any item purchased online. Items can be returned to any TSC Store. Click here for our Return Policy. A pre-order item is a product that you can Order Online and Ship to Store in a large quantity with an early order discount. How do I know if a product is a pre-order product? When will my pre-order ship to store? Once your pre-order is placed, a member of the TSC Ecomm Team will contact you via phone to confirm your order and provide an approximate ship date. Ship dates vary by item and by store. How do I pay for my pre-order? All pre-orders must be paid in full at time of ordering online. How long are products & pricing valid in TSC’s online catalogues? Products featured in TSC’s online catalogues may be available for a limited time only, based on seasonality and stock availability. Pricing in the online catalogues are subject to change without notice. Our website reflects our current prices, which supersedes those in print. Contact us at ecomm@tscstores.com or 1-844-726-9511 Monday to Friday 8am - 4:30pm.